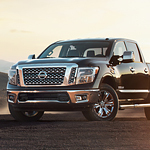 The Nissan Titan XD, a popular full-size pickup truck, has a nice selection of available accessories. Here at Halladay Nissan, we would like to show you all of the amazing accessories that you can add to enhance the enjoyment of your Nissan Titan XD. If you need a pickup with plenty of storage, then you'll want to check out the useful Titan boxes. These boxes are covered and lockable for secure storage and can be easily removed when you need more space in the bed. Fill the waterproof Titan boxes with ice for lots of drink storage. The optional bed liner is made from a sturdy, high-density polyethylene that is both waterproof and rust-resistant. The non-slip surface of this bed liner helps keep whatever your're carrying in place. If you'd like to explore these optional accessories further, then come by our dealership to take a Nissan Titan XD for a test drive.